The Merit 725T Plus treadmill includes some interesting features for a low cost machine such as a power elevation motor to lift the deck up to 10 percent so you can burn calories at any speed or resistance. On the console are two LED windows plus a graphical workout profile display to track speed, time, distance, and resistance level. The seven workouts include weight loss, mountain and hill walks, cardio and endurance challenge, intervals and manual. The Merit 725T Plus treadmill has a motor rated at 1.5 chp (2.25 thp), which is suitable for most walkers but not recommended for runners. It has a pair of thumb pulse sensors to take heart rate readings but they don’t work well (if at all). This treadmill also features a space-saving folding design. Merit Fitness motors are weak so don’t expect them to last even if you are a casual walker, since pulling a belt at a slower speed with a heavy individual on the deck is actually harder on a motor than a light user running at a higher speed. These types of treadmill motors will run hotter and burn out more quickly than better quality ones. Several reviews have indicated that that is just what happens. Also, you should ignore the Merit 725T’s 250-pound max user weight. 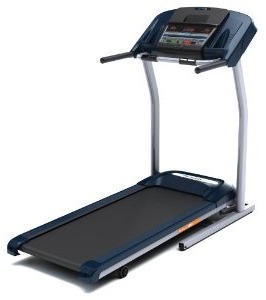 As a general rule, if you weigh over 225 pounds look for a treadmill with a 2.5 chp or better motor. 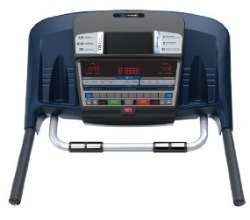 At under $500 on sale, the Merit 725T Plus treadmill is the middle machine of the line-up, stepping up from the 715T ($320) that comes with a manually adjusted incline, and the 735T ($549) (no longer available) that has a power incline and a few more features. The 725T Plus isn’t a top choice since it has too many cheap parts, but unfortunately, there isn’t much selection at this price range. If you can swing it in your budget, spend a little more and get a better treadmill, something that starts at around $599 that will have stronger motors and better warranties.